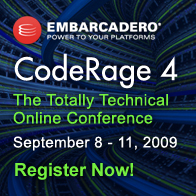 Not only can you download CodeRage 4 session on materials on Reliable Communication between Applications with Delphi and ActiveMQ, but below you can also find the chat transcripts below. (5:38:29 PM) Christine_Ellis [christinellis@chat.codegear.com/jwchat] entered the room. (5:38:37 PM) Christine_Ellis left the room. (5:38:46 PM) Robert_Evans [resevans@chat.codegear.com/jwchat] entered the room. (5:46:29 PM) davidi: johnhofland asked: Do you have any expirience when the queue system (server) fails? We have an application where speed is less relevant then then the message has to be delivered. Are messages saved when bringing up again?. Answer: The Messaging system keeps it in the queue. when the recipient or server come up – the message gets delivered. That’s tbe beuty of the architecture. (9/11/2009 8:24:45 AM) Jeroen_Pluimers: hi everyone; jibber lost the connection, just like the web interface over the last couple of days. (9/11/2009 8:25:11 AM) Jeroen_Pluimers: hopefully it stays alive for the next two sessions though. (9/11/2009 8:25:49 AM) Nicole_Boivin: Sorry David. Wrong room. The comment was meant for Room 1. I am currently multi-tasking to the extreme: phone call, both sessions and an app for my phone info. In general I am impatient person. I insist that the apps I build launch under 2 seconds and I start to hammer them that fast. The clients are usually impressed. (5:15:34 PM) b_fisher left the room. (5:15:51 PM) Jeroen_Pluimers: If you have questions; please queue them up so I can start looking at them. (5:15:58 PM) b_fisher [rcf2@chat.codegear.com/jwchat] entered the room. (5:29:06 PM) Jeroen_Pluimers: Since ActiveMQ is well known, has been stable for a long time, and runs on many platforms, it was never a question to switch to other types of middleware. (5:29:49 PM) Thomas_Grubb: The reason GMSEC existed is because middleware kept coming and going too fast for our customers (NASA likes to think long term). At one time, GMSEC has supported ICS’ Message Bus, Elvin, and a few others. (5:30:21 PM) Thomas_Grubb: How is the speed of ActiveMQ with Delphi? (5:30:34 PM) Jeroen_Pluimers: This whole project is a proof of concept, so no ‘really long term’ things yet. (5:32:28 PM) Jeroen_Pluimers: it is! (5:34:44 PM) Carlos_Adolfo_Garcia_Anaya [dolfuz@chat.codegear.com/jwchat] entered the room. (5:36:19 PM) Carlos_Adolfo_Garcia_Anaya: I can’t enter to the conferecnes, is there any problem now? (5:37:35 PM) Jeroen_Pluimers: @Thomas: so your Delphi stuff was server as well as client? (5:38:26 PM) Robert_Evans [resevans@chat.codegear.com/jwchat] entered the room. (5:38:53 PM) Erwin_Mouthaan [mouthaane@chat.codegear.com/jwchat] entered the room. (5:39:46 PM) davidi left the room. (5:40:31 PM) davidi [davidi@chat.codegear.com/jwchat] entered the room. (5:47:23 PM) Borland [jajackson@chat.codegear.com/jwchat] entered the room. (5:47:29 PM) Thomas_Grubb: Thanks for your presentation. It’s great to see Delphi being used with MOMs! (5:47:41 PM) Neville_Cook [neville+cook@chat.codegear.com/jwchat] entered the room. (5:47:55 PM) Jeroen_Pluimers: Bye Thomas! (5:48:03 PM) Thomas_Grubb left the room. (5:50:15 PM) Neville_Cook left the room. This entry was posted on 2009/09/11 at 19:17	and is filed under Component Development, Database Development, Debugging, Delphi, Development, Encoding, Firebird, Java, Software Development, Unicode, XML, XML/XSD, XSD. You can follow any responses to this entry through the RSS 2.0 feed. You can leave a response, or trackback from your own site.